Kendall and Kylie Jenner have recently launched their new collection for Pacsun. If you check the Cali-retailer’s website, the pieces being offered are actually quite wearable. That is, if you’re into boho dressing. It’s like a toned down version of how fashion at Coachella looks like. We’re not bashing the line or anything. After all, it’s all about how you wear a garment, not the garment itself. Besides, we can’t deny that there are a few must-grab items in this collection, like a cute fit n’ flare printed dress, some ripped black skinny jeans, and a floral jumpsuit. The cream of the crop, however, would have to be the long kimono Kendall wore to the Pacsun collection signing in Dallas last week. The leggy model arrived at the event in a black-and-white outfit punctuated with gorgeous strappy sandals from Aquazzura and the long topper. It was a simple combination but it was also glamorous. 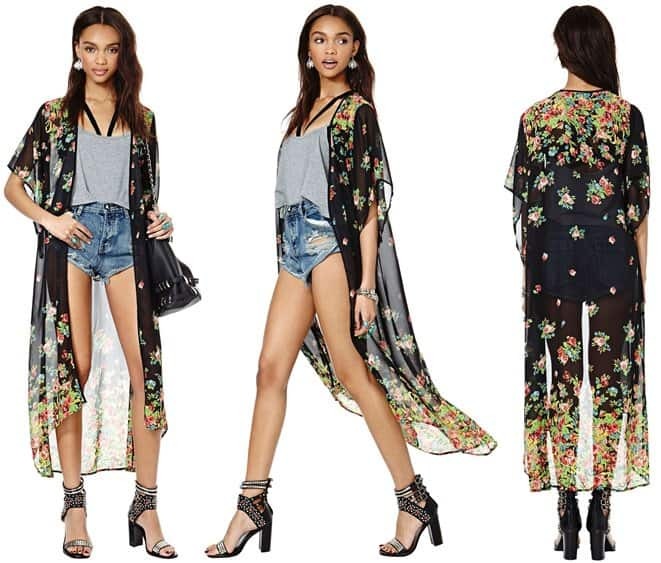 We’re crushing on her kimono immensely. It features a floor length hemline, long sleeves instead of the usual elbow-length, and a relaxed fit. Not only that, but it comes in a lightweight material so it’s great for layering over tanks, tees, cutoffs, jeans, and even your bikini. For those who want something even more sheer and lightweight, simply head over to NastyGal and purchase the Reverse Forget Me Not Kimono. It’s crafted from chiffon material and features short sleeves.